Growing up I heard this phrase over and over again... "Offense sells tickets, defense wins games." To be quite honest I never understood how defense can win games if they aren't the ones scoring? I especially hated this because my coaches would always utter this phrase right before I heard, "10 suicides, GO!" Just to continue my rant since I am good at that, my final point is that yes offense does sell tickets and isn't that what it is all about anyway? If you had a defense going around winning games all over the place, but no one is in attendance with their face value ticket price, or higher because they got ripped off by some bum scalper, well then, Mr. Jerry Jones (Cowboys Owner) you don't have a team now do you? So YAY Offense! 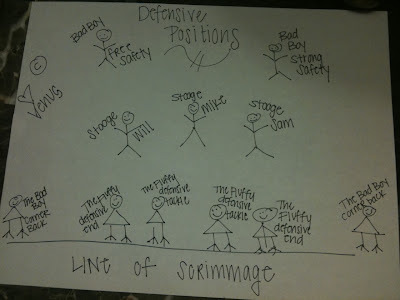 I am going to try and put aside my bias for the offense long enough to explain defense 101! There are 3 different groups of people to a standard defense. THE FLUFFYs: 4 SEEMINGLY OBESE DUDES--- THEY ARE NOT FAT, THEY'RE FLUFFY! You have 4 guys lined up that are equivalent to the "Fattys" I talked about in the offensive position post. A Fluffy is basically a defensive fatty. We will call these 4 guys the "Fluffys" because after all they aren't fat, they're fluffy! On the end of each side are the fluffy's defensive ends. Their job is to make sure none of the hotties get around them on the outside. Simple as that. They each try to keep their eyes on the ball carrier and either bring them down, or force them back to the middle where they have a fellow fluffy to try and help take the ball carrier down. 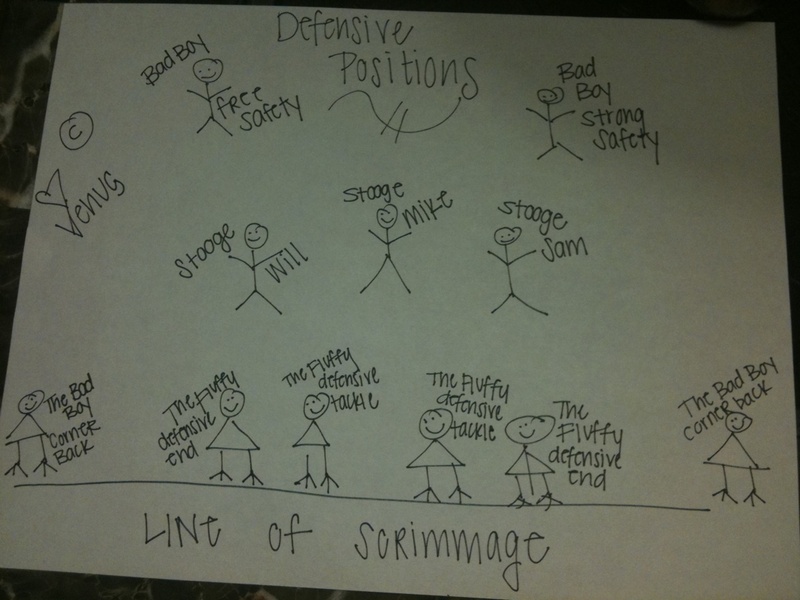 Then in the middle for the fluffy's are the two defensive tackles. Their job is to stop any run plays up the middle or to stop any advances from the QB. They try and pressure the QB on any passes he makes as well. THE 3 STOOGES ON STEROIDS: 3 massive dudes that could smash your head in. The next 3 guys behind the Flufys are The 3 Stooges On Steroids: aka the linebackers. They have traditional nicknames of Sam, Mike and Will. The linebackers have a lot of responsibility. Their goal is to stop any run that the fluffys let get through initially. They also are asked to cover any passes that may be delivered in their area of coverage. The strongside is the most important position for the linebackers. They are stationed where the most receivers will be. If they offense has a wide receiver and a tight end on one strong side, they have the responsibility of stopping their run or covering the pass for anyone on their side. I love the Hotties on the offense. I mean, they are great, they clearly sell tickets as discussed before. And they are super talented and it takes tons of effort to not try and be a sniveling little girly groupie with your love for the Hotties. I'm going to drop a Glee reference. Since you read this blog I'm sure you were the most popular girl in high school, the cheerleading captain and class president. I bet you dated the quarterback. You were Quinn from Glee! Finn was your main squeeze. He was clean cut, well-mannered, supported your presidency of the celibacy club and always finished his sentence with yes ma'am! It was a no-brainer that you were perfect together. But on the other side of the field was Puck. Puck has a mohawk, a tough exterior, and lives on the wild side. He doesn't have a polite bone in his body. He wears black and probably has a tatoo in some place that wouldn't be acceptable for viewing in a PG-13 movie. Puck lives to make daddy wait up for his little girl to come home from their date cradling a shot gun in his arms. So if you are Quinn, you know you should only have eyes for Finn, but why is your mind drifting to Puck? Because of the excitement of that other side and because of the thrill the bad boy gives you when he steals the spotlight from the Finn's of the game! Duh! Cornerbacks or Defensive Backs: 2 guys that cover the wide receivers. Their only role is pass coverage responsibility. They either have man to man defense coverage meaning they are stuck like white on rice to one specific player or they are in a zone defense where they are responsible for covering a specific area of the field. They are required to deny any pass attempts or intercept QB passes. Safeties: They are lined up in the back of the defense. There are two of them. The strong safety is on the strong side of the field where the most offensive players line up. They are the LAST line of defense and must tackle a running back who may have snuck through, or must cover any kind of pass that gets launched downfield. The other safety is the Free Safety and he has to make sure NO receivers get behind him. He often makes game changing interception catches. "Hotties sell tickets but the Bad Boys win the girl--- errr--- I mean game!" Watcha think Venus Lovers? Well, till next time, Happy Bad Boy Fantasizing Venus Lovers!